Please join us this Monday to fight hate and build love. 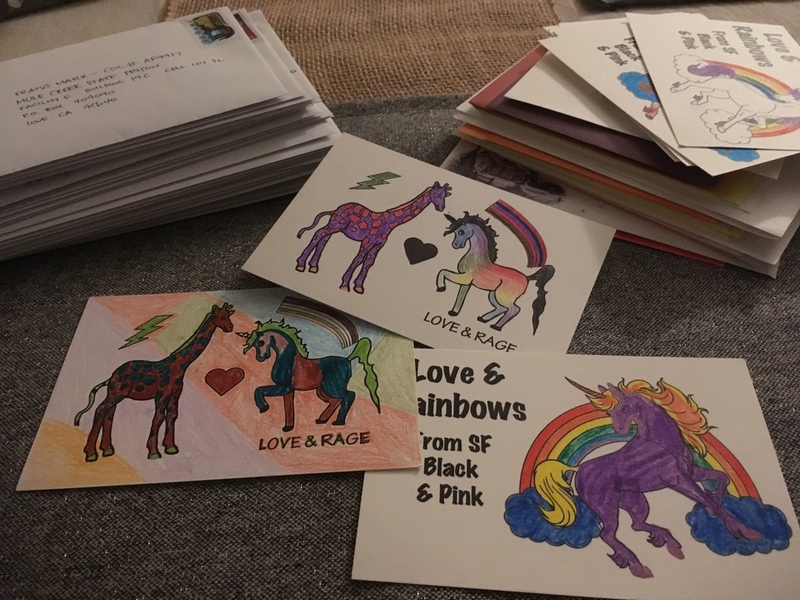 We have new penpal orientation if you’re ready for the commitment as well as some mail to process and one time postcards to send in to our Queer & Trans members in San Quentin and RJ Donovan (down in San Diego). 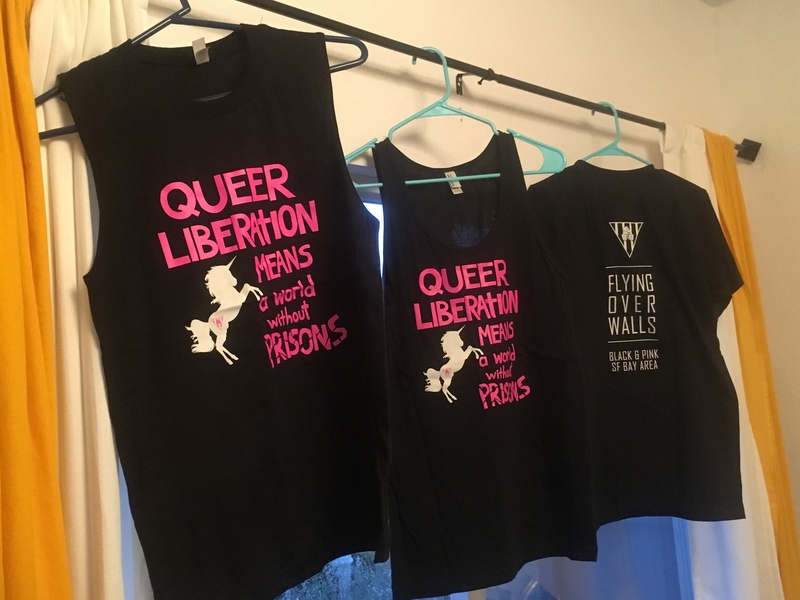 We will also have our brand new “Queer Liberation” t-shirts for sale (currently sizes M-XXXL – more S and XS coming soon). We are continuing to visit some of our incarcerated members. If you have a penpal and are interested in visiting them, request that they send you a visitation form and then send it in. We can assist, if needed. We have visited Mule Creek State Prison, San Quentin and plan on returning to those as well as visiting CCWF, and possibly California Medical Facility and CSP-Sac. 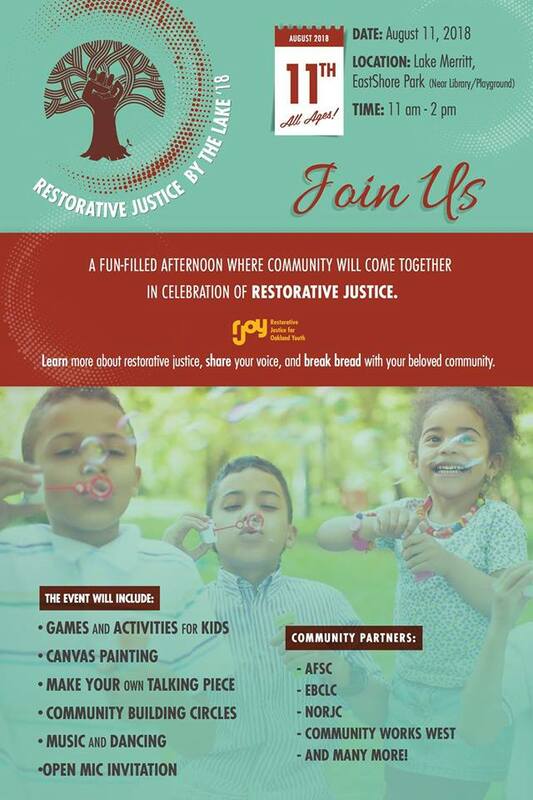 We’ll be going to MCSP this Sunday 9/24 and are planning trips to San Quentin & potentially MCSP in November. We are looking for a volunteer to send in a visitation form and to start corresponding with a specific member in SQ whom we want to visit. Please email if interested. We continue to meet monthly to build our leadership team and our collective capacity. Respond to this email if you are interested in getting involved with leadership! Wed, Sep 27 JNow: Stamp Drive Packing Party! 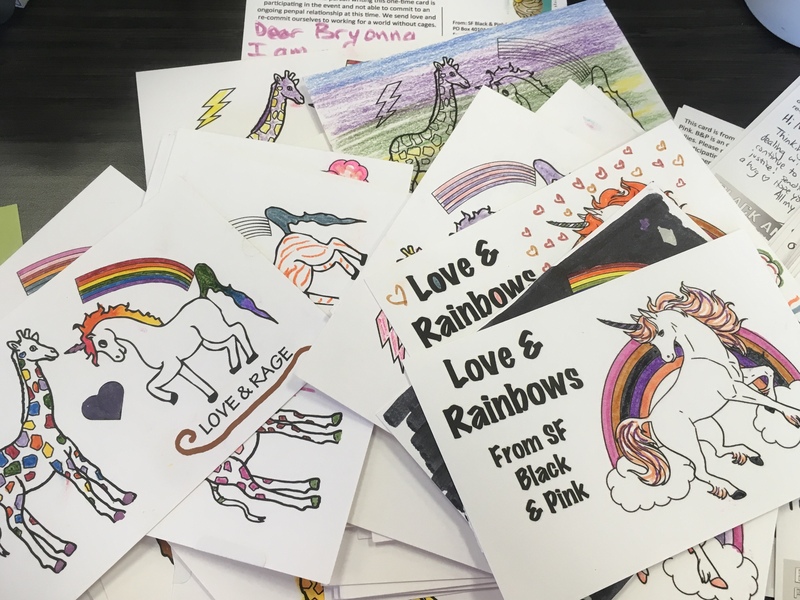 Every Tuesday – our friends at TGIJP have mail night from 4-8pm at 234 Eddy St. More info here. Today, on this global day of action against the Dakota Access Pipeline, Black & Pink Chicago shares this letter of solidarity with the Standing Rock Sioux Tribe and all people in the struggle to save our water. Water is life. Our work towards abolition requires us to ensure that all people have their basic needs met: housing, food, air, water. The Dakota Access Pipeline stands in the way of our vision of a world without police and prisons, a world that values life over profit. Time and again, we have seen that prisoners are often the last to get access to clean water under disaster capitalism. We saw it after Hurricane Katrina and Hurricane Sandy and so many other “natural” disasters. We saw it in Illinois a couple months ago after Gov. Rauner’s refusal to pass a budget in Illinois left some counties with exorbitant water bills and threatening to cut water off to thousands of people locked in state prisons. This pipeline is a threat to hundreds of our Black & Pink family, thousands of other incarcerated people, and millions of non-incarcerated people in its path. In addition to the environmental destruction this pipeline will create, we abhor the militarized violence that water protectors have faced while resisting its construction. In North Dakota, security guards working for the pipeline company have attacked indigenous water protectors with dogs and pepper spray. We must resist the ongoing genocide of native peoples through toxic polluting and theft of sacred lands, as well as the brutalization and incarceration of those who resist. May enough of us be enraged and moved to action by this to stop state and corporate violence, to stop this pipeline, and to disarm the police. No to the Dakota Access Pipeline. Not at Sacred Stone. Not in Illinois. Not anywhere.